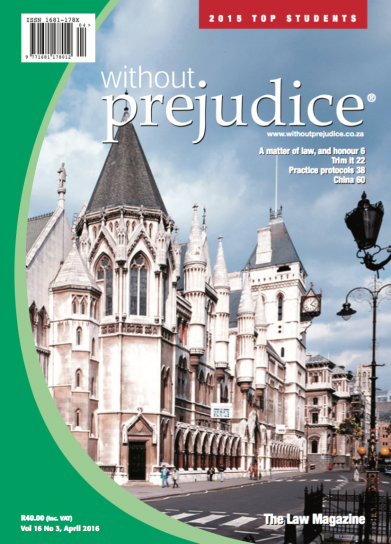 Is without prejudice goes to print we are a world at war. One quite as deadly, but much more silent and insidious than the First and Second World Wars. The perpetrators sit in safety while others carry-out their dreadful plans, aimed at inflicting misery on innocents. It has been said that this is something the world must get used to. It was inevitable that the Public Protector's powers would be tested before the Constitutional Court – though few could quite imagine the ensuing crisis, which shows no sign of abating. Demands for the President's resignation have been multitudinous, and an impeachment process played out unsuccessfully in parliament. In Part 1 of this article, we explained what is meant by "price signalling", and concluded that it is possible that price signalling may constitute a concerted practice under s4 of the South African Competition Act. This second part explores the circumstances when price signalling could constitute an illegal concerted practice. Research on the efficacy of independent directors serving on boards of directors has shown mixed results. There is general consensus that the presence of independent directors improves corporate governance. On the other hand, the failure of companies such as Enron and African Bank, which quantitatively were able to tick off all the best practice governance boxes, raises the question as to the value of independent directors. In a recent finding in KwaZulu-Natal the High Court ruled on the applicability of s347(1A) of the Companies Act (61 of 1973) (the Old Companies Act). The recent case of Bibby Factors Northwest Ltd v HFD Ltd & Anor  EWCA Civ 1908 in the English Court of Appeal confirmed the position under English law of a debtor's right to set-off against an assignee. In England and South Africa alike, the issue of the validity of a debtor's right to set-off against an assignee or cessionary is particularly relevant where companies access credit by selling their debt to a bank or factoring company. Recently, articles published in the media report that the United Kingdom is the latest jurisdiction to permit the editing of DNA to remove possible disorders from human embryos. This follows an announcement by the Chinese government, during the course of 2015, that it has carried out gene-altering therapy. The Supreme Court of Appeal, in City of Tshwane Metropolitan Municipality and Others v Nambiti Technologies (Pty) Ltd  1 All SA 332 (SCA), held that the cancellation of a tender is not administrative action and, therefore, not subject to the Promotion of Administrative Justice Act (3 of 2000) (PAJA). The judgement is a clear affirmation of the primacy of the executive branch of government in setting procurement priorities. Peremption (not to be confused with pre-emption) is not a word you hear every day. At common law, the doctrine of peremption states that a party must make up its mind: it cannot equivocate by acquiescing in a judgement and then, later on, deciding to appeal. Arecent decision of the Western Cape High Court confirms that the right to an unrestricted view does not automatically vest in terms of the common law. The appropriate manner to secure this right is to register a servitude against the title deeds of the properties in the Deeds Registry. The discussion of the court sets out the basic principles relating to interpretation generally and interpretation of servitudes specifically. May an employee resile from a settlement agreement because it bars him from claiming unfair dismissal? Will our courts enforce an agreement that deprives the employee of his statutory right to challenge the fairness of his dismissal? The Labour Appeal Court (LAC) recently considered this issue and provided us with guidance. Insofar as fiduciary duties are concerned, it should be noted that although they are now statutorily entrenched, prior to the insertion of s7C(2)(f) into the Act (In terms of s9 of the Financial Services Laws General Amendment Act (45 of 2013), with effect from 28 February 2014) there was debate among academics as to whether trustees in fact owed a fiduciary duty towards members and beneficiaries. Given that a Fund (unlike a Trust) is a legal person and that members of a Fund do not have rights to assets of the Fund, it was argued that the trustees only owed a fiduciary duty to the Fund and not to the members or beneficiaries. There's nothing that charms a visitor to the platteland more than the sight of cattle and horses roaming the streets of a little dorp – except maybe a few sheep browsing the local soccer field. Great photo ops, they provide proof that the camera-wielder really made it out of the city. As a result of an ARIPO Administrative Council Session that took place in Zambia in November 2015, there have been some significant developments regarding ARIPO patents, designs and trade marks, including fee increases that took effect from 1 January 2016.